Here are some terrific upcoming professional development opportunities for teachers of all grades (please scroll down). To support civic learning in classes as well as individual student projects, we are planning a Civic Engagement Fair for September. We are inviting organizations on the Civic Engagement partner list; please let us know if there are other organizations you'd like us to include. We also welcome hearing from you about projects you're interested in developing in the coming year -- we are excited to support you! Our workshops are offered both in-person and online. In-person workshops last anywhere from 2 hours to 1-3 days, whereas online workshops typically last 3-5 days. Pricing can vary from workshop to workshop, with some events being free and others requiring registration fees. Look for these details within individual event listings. The Chicago Freedom School offers a variety of trainings for adults, youth, and intergenerational audiences. All trainings are rooted in anti-oppression practices and designed in a movement-building framework. CFS hosts in-house trainings that are open to the public as well as customized trainings for schools, organizations, houses of worship, and other groups. All trainings are led by CFS staff members with experience facilitating professional development for staff, youth groups, and intergenerational audiences. To schedule a training for your organization, please contact us directly or complete this Training Request Form. Join us to gain skills that sharpen your knowledge and ability to be an effective organizer and campaign supporter. Participants will examine the elements of successful campaigns and learn tools for analyzing power, framing issues, and base building. Sliding scale: $15-$35. Dinner provided. In this session participants will explore the fundamentals of popular education and how to use it as a tool for organizing across multiple issues. Sliding scale: $15-$35. Dinner provided. This workshop promotes dialogue and critical analysis of social movements of the late 20th and early 21st century and their impact on the black freedom struggle in America. Individuals 23 and younger free. Sliding Scale: $15-$50. Dinner provided. This workshop is a space for white people committed to anti-racist practices to collectively reflect and build strategies that interrupt systems of white supremacy and actively challenge racism as a barrier to multiracial movement building. Using interactive activities and discussion, we will reflect on our own lives, learn about anti-racist freedom fighters and explore counter-narrative histories of resistance. We will also explore the prison industrial complex and prison abolition. Lunch and light breakfast included. In this workshop, participants will strengthen an understanding of how identity, power and oppression interact and how one's own identity fits into systems of power and oppression. We will also examine the history of anti-black racism in the US and the roles and strategies of white anti-racist freedom fighters. Building off of the first workshop, this session continues to unpack systems of privilege and power. We will discuss how systems of white supremacy impact our own lives and impact how we act in relationship with others. Using role plays, we will discuss how racism can show up between individuals and how we can interrupt. This final session will focus on developing anti-racist practice within our communities and institutions, as well as help us collectively identify the potential role of white anti-racist practices in movement building. We will explore history of resistance movements and how white anti-racists stood in solidarity with people of color in order to make connections to present-day strategies for anti-racist coalition building. This workshop is offered on a sliding scale. Discounts and scholarships are available. Do you want CFS to facilitate a workshop or professional development training at your organization or school? We offer a variety of options. Please contact us for more information. Understanding Adultism Understand adultism as a form of oppression and learn how to become an effective adult ally. Anti-oppression Practices within Education Develop an anti-oppression analysis and anti-oppression practices as educators. Leadership & identity development A Positive Youth Development model designed to support youth in their development as social change leaders and movement builders. REV UP Chicago Freedom School's four-day training institute for youth organizers and youth workers who are interested in exploring how to incorporate social change approaches into their work. Recognizing Identity, Power, and Oppression Explore different aspects of identity and the relationship between identity and oppression. Participants will reflect on their own identity and develop anti-oppression practices that will help them be allies to oppressed people. White Folks and Racial Justice A day of training for white people interested in understanding the concepts of white privilege, white supremacy, and learning how to become a responsible white ally. LGBTQ 101 Develop a greater understanding of sexual orientation and gender identity. Participants will reflect on their own identities, and consider the oppression faced by LGBTQ people. Movement History Learn about past movements for social change and their connection to today's social justice issues. Legacy of Freedom Schools Explore the history of Freedom Schools and their impact on today's Education for Liberation Movement. Campaign Development Learn the steps to developing and supporting youth led campaigns. Coalition Building This workshop explores different concepts and models for coalition building and what to consider before entering alliances with others to work towards shared social justice goals. Action Planning Learn the skills and tools for planning effective protests, rallies, marches, and events to support community organizing and campaign development. Understanding Adultism Via a web based presentation, understand adultism as a form of oppression and learn how to become an effective adult ally. Navigating the Grey Zone Learn skills to navigate boundaries while supporting young people in meeting their social and emotional needs via a web based presentation. It's that time again! Apply to participate in Mikva Challenge's classroom-based programming for the 2017-2018. The online application form is here. Opportunities for students to participate in special events, such as the Project Soapbox Citywide Competition, Action Civics Showcase, and various youth issues forums. Access to the new Mikva Action Civics Network, an online platform where teachers can view and download Mikva lessons, see sample student action civics projects, and connect with other teachers who "do Mikva Challenge" at their schools. 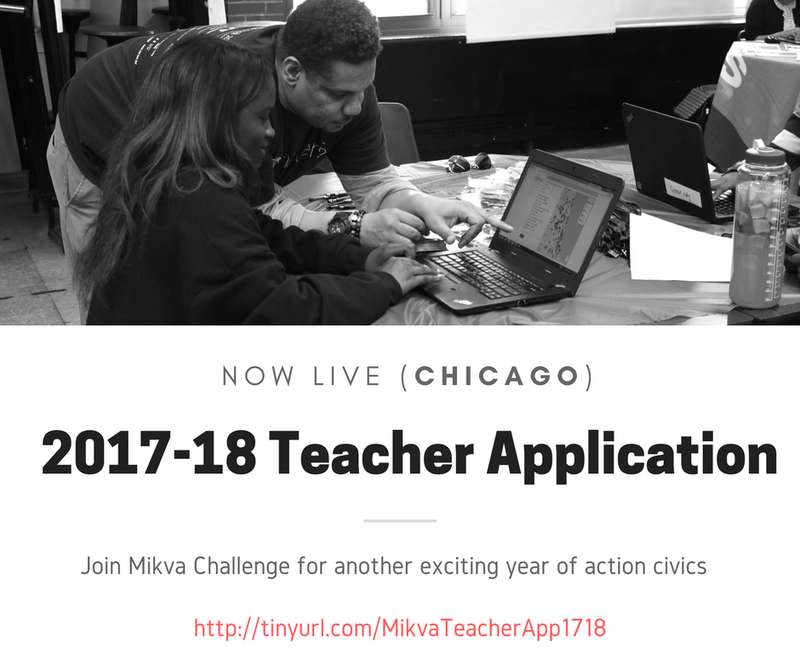 This application is for teachers in Chicago who are interested in participating in MikvaChallenge programming.